This is an oldie, but a goodie. Clearly articulating the reasons for change and providing regular information flow to impacted staff will help reduce resistance. I’ve always held a firm belief that staff can deal with bad news, what they don’t like is an information vacuum or ongoing ambiguity. Establishing the appropriate communication channels and processes early can help nip any resistance issues in the bud. Clear communication also ensures that staff understand the rationale for change and have the necessary information to successfully manage the transition. I’m also a big believer in Peer or Leader lead communication. In my experience staff are extremely wary of glossy looking communication packs designed and delivered by external consultants (trust me on this – I am one!). For messaging to be absorbed deeply Change & OD Practitioners, regardless of whether they are internal or external, need to work with the Line Management and tailor the communication approach to come from a trusted source wherever possible. Where resistance is starting to manifest, it will often appear first in smaller pockets. It is important to engage directly with the individuals displaying the resistance. This engagement should initially give them a voice and allow them to articulate specifically what their concerns are. It’s important at this point not to dismiss or agree with their concerns – but rather to help them focus on the issues rather than any emotion attached to the change. This is often best done in workshops / group meeting environments. The engagement is best conducted with a Project or Business Representative. Putting the effort into personal engagement helps to build some credibility with the staff who are resisting and should mean that they become more receptive about working through issues and concerns collaboratively. Once you have engaged with the individuals displaying resistance you can start to identify exactly what the issues are and where you are happy to discuss finding some common ground. It is vital at this point to also identify the things that are not up for negotiation. 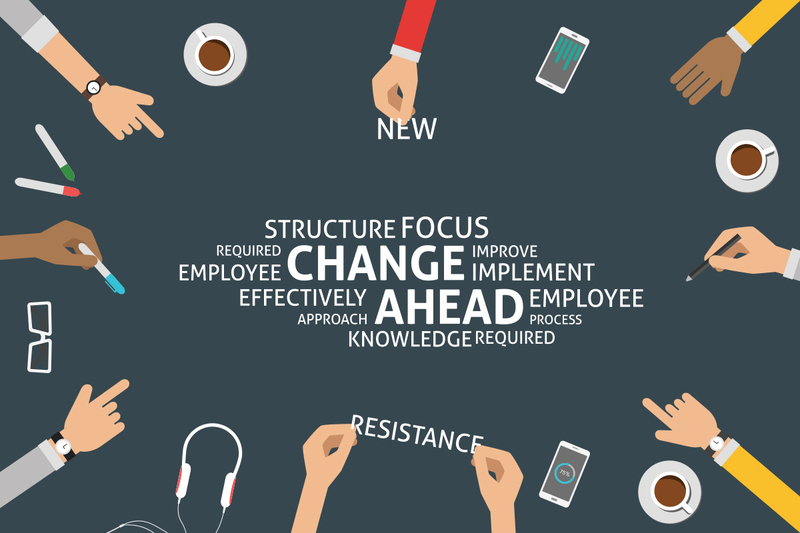 You may be willing to discuss making slight changes to the transition schedule or the final organisational structure, but you need the resistors to understand that the change will still go ahead. The point here is to encourage some constructive engagement around contained areas of interest. By involving the resistors in the decision making process at this level you give them some skin in the game of the overall change. By giving them a small win on an issue that doesn’t dilute the overall benefits of the change you can turn the resistors into advocates. Workplaces display a number of dynamics and are often influenced by stronger (or louder) minorities or individuals. In some organisations this could be the staff with the longest tenure. In others it could be the staff with the most capability or technical skill. In many blue collar or operational organisations this could be the group of Union delegates. When designing an engagement approach to help manage resistance it is worth targeting those in the workplace who have the most influence or who are likely to make the most noise. Getting these people ‘into the tent’ can help turn them into advocates and their influencing skills can become a positive force for change. This can be achieved by seconding these people into the Project environment or by including them in various reference or working groups. Whilst they may have a short term impact on the homogeneity of the Project or working group dynamic, in the longer term the key influencers can make a massive contribution to uptake and adoption levels with the impacted staff groups. Change Management is a discipline where art meets science. To ensure that you identify potential resistance pockets early, it’s important that a structured approach to analysing, planning and executing the change initiative is undertaken. Deep level Change Impact Assessment focusing on the impacted staff groups should be conducted in the early stages of the initiative. Whilst some flexibility and intuition is required through execution, the initial planning period of a project should be used to more systematically identify change impact and potential for staff push back.